Two consumer interest groups are asking Facebook to withdraw its proposed changes that would, among other issues, remove the ability for users to vote on modifications to Facebook's data usage and privacy policies. The company also wants to change how you filter incoming messages on Facebook, and Facebook wants to freely share user data between companies it owns, such as Instagram. The Center for Digital Democracy and the Electronic Privacy Information Center said in an open letter to Facebook CEO Mark Zuckerberg that the planned changes “raise privacy risks for users, may be contrary to law, and violate [Facebook's] previous commitments to users about site governance.” The social network may have been trying to slip the changes under the radar, announcing them the day before Thanksgiving. Do you really want the vote? The Center for Digital Democracy and the Electronic Privacy Information Center say that even though Facebook's voting requirements set an “unreasonably high participation threshold” at least the right to vote was in place. Dumping the vote “raises questions about Facebook’s willingness to take seriously the participation of Facebook users,” the two groups said. If Facebook does dump the vote it would be particularly damaging for the privacy information center; the group was instrumental in getting Facebook to reverse a set of privacy changes in 2009 that resulted in Facebook instituting the site governance vote for users. Facebook also wants to remove the “Who can send you Facebook messages?” control that lets you decide who can contact you on Facebook. 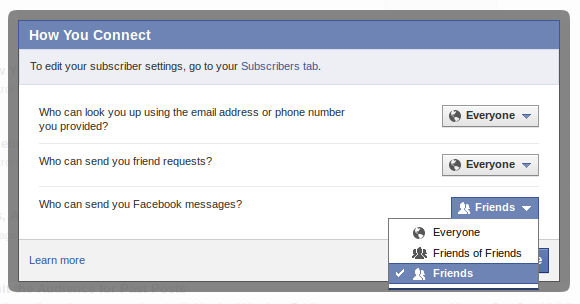 The setting is currently buried in your privacy settings under “How You Connect.” The messages setting would be replaced by what Facebook calls “filters for managing incoming messages.” The Center for Digital Democracy and the Electronic Privacy Information Center are concerned that changes to Facebook Messages could result in users receiving more spam, a popular method of attack for malware on Facebook. It's not clear whether Facebook's new messaging filters would be part of the newly revamped Facebook Messages window or if the changes would be part of your privacy settings. Facebook also wants the ability to share user information with “businesses that are legally part of the same group of companies that Facebook is part of.” These businesses would be referred to as “Affiliates” and would most certainly include Instagram, the popular photo-sharing service Facebook acquired in 2012, which currently operates independently from Facebook. The Center for Digital Democracy and the Electronic Privacy Information Center believe the “affiliates” designation in Facebook's data use policy is an attempt to merge user data between Facebook and Instagram. The groups argue merging user data could violate Facebook's recent privacy settlement with the Federal Trade Commission . Facebook's FTC agreement requires that the social network obtain users' express consent before sharing their data beyond what their privacy settings allow. The privacy groups also argue that Facebook's changes amount to the company reneging on its original intention to operate Instagram independently of Facebook. “We plan on keeping features like...the ability to not share your Instagrams on Facebook if you want, and the ability to have followers and follow people separately from your friends on Facebook,” Zuckerberg said in August after Facebook's Instagram buy cleared regulatory hurdles. But whether users will be bothered by a potential Facebook-Instagram data merge is unclear. Many users already share their Instagram photos on Facebook and Twitter. And a large number of Instagram users have wide open Instagram accounts that are viewable by almost anyone thanks to Instagram's new Web-based profiles. One potential problem would be if your Facebook data began appearing on Instagram without your consent, but it's not clear whether Facebook's new data sharing policy would go that far. If you'd like to read Facebook's proposed changes, you can find them on the Facebook Site Governancepage. This is the second time Facebook has introduced a major policy change during a holiday weekend. The first was in early 2011 when the company announced third-party home address sharing on its developer blog right before Martin Luther King Jr. Day. Facebook was forced to reverse its home address sharing plans just days later because of public outrage.